I am the human resource department intern at HumanKind. Each day I am assigned new tasks, but my primary job is to shadow each individual in the HR department to learn about their roles and responsibilities. How did you find out about it and why did you want to do it? 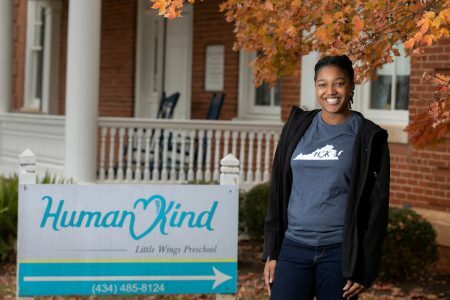 When trying to decide where to intern, I told [internship director] Maegan Crews about my interests in working for a nonprofit organization that benefits society. I wanted to work somewhere that helped people and the community. Maegan suggested I go online and read about HumanKind, and once I did, I knew it was the place for me. What are you getting out of this experience and how does it correlate with your business major? Every day I go into my internship, I learn something new. The HR director, Korin, makes sure I learn as much about the field as possible and encourages me to ask questions as well. I am able to see first-hand some of the topics I am learning in the classroom like management, economics, sociology, etc. My career goal is to be a human resource manager when I graduate with my bachelor’s degree. This internship in the field of HR is helping me to see if this is truly the career path I would like to pursue, and I can say that, so far, this internship has not led me astray but rather confirmed this is what I want to do.